Our company provides a wide range of customizable drinkware products for your special events, parties, weddings, showers and more. Browse our drinkware from the menu above to view our online catalog. Each of our items can be also be customized with your logo or text of your choosing! Many people do not like the ice cold sensation that they experience while sipping from their favorite bottled or canned beverages. To remedy this, we have koozies! 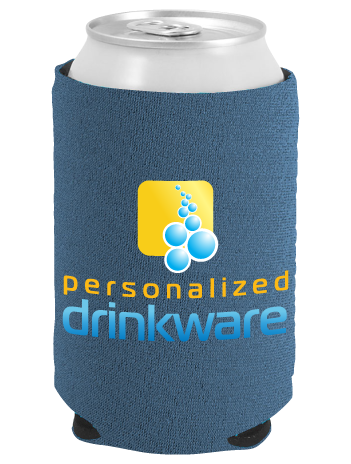 Manufactured for the purpose of keeping your hands and fingers warm, koozies are also ideal for prohibiting that cold drink from getting warm because of your body heat! Therefore, don't keep switching that cold drink back and forth between your left and right hand! 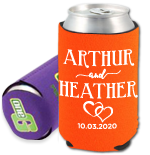 Some of the best uses of koozies can be as birthday party favors, customized wedding favors, bachelor and bachelorette party favors, holidays, and much more! The list is nearly endless for the amount of reasons that you may want to have or give koozies as a gift! In addition to our wide selection of koozies, we also offer water bottles, tumblers, and more. We are proud to offer a wide selection of customized drinkware, beverage insulators, and promotional items on our website. From our boot koozies to our personalized water bottles we use quality material for all of our products. Each order comes with the knowledge and expertise of our design team to ensure that your item is printed exactly how you want it to look. For you last minute shoppers in need of a rush order we offer as little as 1 day production time on many of our items. 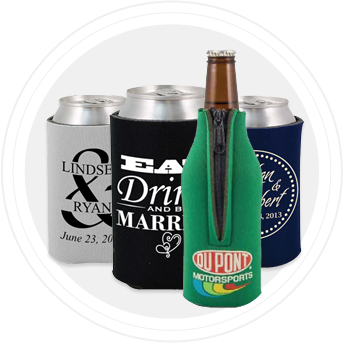 We are here to help you pick out wedding koozies as your favor for your special event. Prefer to keep it a little more laid back? If so our camo koozies are perfect for you! Having customized drinkware from PersonalizedDrinkware.com will make any occasion or event memorable. What's more, many people will re-use their drinkware time and time again as they host their own parties and events! With one of the largest selections of drinkware on the Internet, PersonalizedDrinkware.com is your go-to source for high-quality products at great prices. If you have any questions about our drinkware we can be reached by telephone at 866-989-8880, or you can email us at Sales@PersonalizedDrinkware.com. Thank you so much for helping get our order in last minute. The coolers arrived on time as promised. A pleasure to work with. My clients love them! Ready to customize your koozies? © 2016 Personalized Drinkware, LLC. All Rights Reserved. KOOZIE® is a registered trademark of BIC Corporation and use herein is by permission.